This page focuses on improving the ways that we store food in order to extend its life. This is an important step in reducing food waste - reducing it at its source. Reducing food waste at this level has multiple benefits. For the individual, this can help reduce grocery bills and time spent grocery shopping. It can also help save money by reducing the cost of trash and composting services. And of course, there are the environmental implications. Reducing the amount of food going to waste also reduces greenhouse gas emissions created in both the production of food and its disposal. In addition to proper storage and life extension, thinking creatively in the kitchen can also help reduce food waste. For example, many vegetable scraps that you might consider trash can be frozen and used for making stock or soups, or stale bread can be used to make croutons. 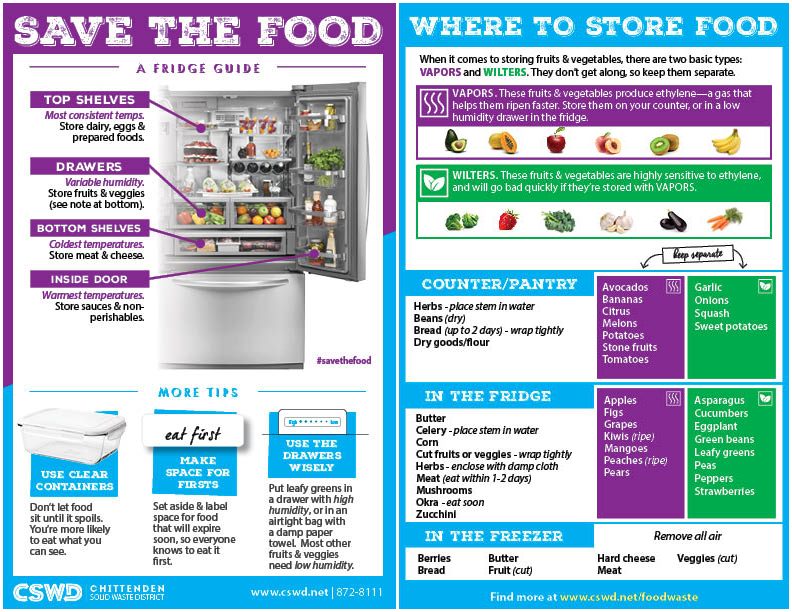 How to Properly Store Fruits and Vegetables [CSWD] Printable poster of recommended storage strategies for common foods. The Shelf Life of Food [CSWD]. Poster comparing how different storage techniques impact shelf life of common food items. Food Waste Quiz [I Value Food] A quiz to see how much food you really waste on an individual level. Has tips for reducing foodwaste after the quiz. Still Tasty – Your Ultimate Shelf Life Guide. Searchable database of food items, storage techniques, and shelf-life. Eat or Toss? – Answers if food is still edible or not (with images of common food concerns). Also has ‘use-it-up’ recipe section. Smart Prep: Prep Now, Eat Later [EPA]. Food Preparation Guide. Smart Storage [EPA]. 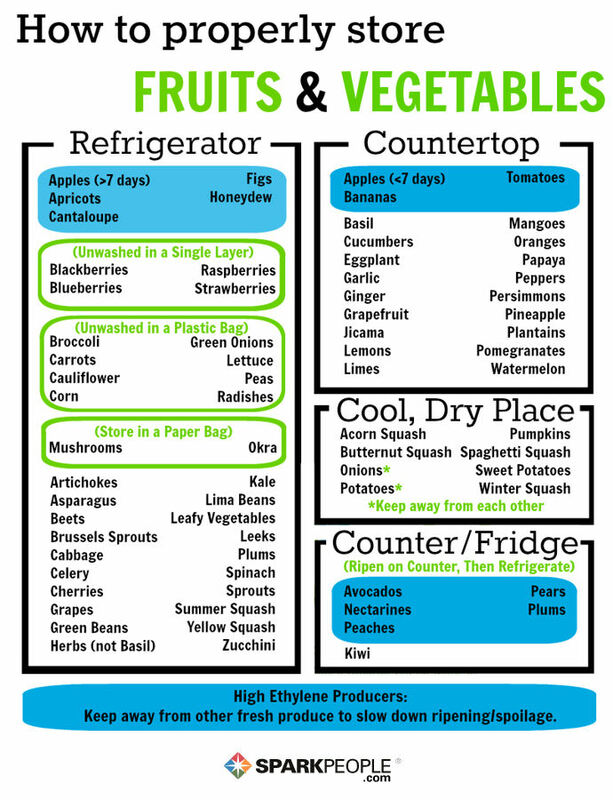 Fruit and Vegetable Storage Guide. Smart Shopping: Shop With Meals in Mind [EPA]. Shopping list designed to help reduce food waste. Get Smart: Take The Challenge [EPA]. Consists of instructions and worksheets for households to collect and measure how much food they waste over the course of a two to six week challenge. Food Keeper App [FoodSafety.gov] Developed by the USDA, Cornell, and the Food Marketing Institute. Suggests time windows in which to consume specific food products. Waste Less Food at Home [West Coast Climate Forum] Helpful tips and links to downloadable tools to help reduce food waste in the home. Do Not Put Food Scraps Down the Drain! [ANR, printable sheet] Impacts of disposing organics down the drain on municipal and on-site wastewater treatment systems. Vermont State Law Disposal Bans [ANR] Printable color poster of the different materials banned from Vermont landfills. Vermont Life – “Waste Not, Want Not” Tips on how to reduce food waste in accordance with Act 148, written by local author Melissa Pasanen.